An easy recipe for extra fudgy brownies with very few leftovers to tempt you! Deliciously rich, even with no butter, refined flour or sugar & only 67 calories! In high school since my birthday fell the day after one of my best friend’s, we always celebrated together at TGI Fridays, a favorite restaurant of ours. We tried to arrive before the dinner crowd, and after the hostess seated us at a cozy booth, we each handed the other person a gift bag with tissue paper poking out of the top before opening the menu. As creatures of habit, we both ordered the same thing on every visit: a light salad with chicken for protein, water for me, and iced tea for her. While waiting for our entrées to appear, we opened our birthday presents. Since she put together scrapbooks in her spare time (and still does! ), I often gave her fun stickers or pretty patterned paper for her to use. We slowly savored every bite of that decadent dessert, scraping up the last lingering brownie crumbs and chocolate drips with our spoons before the waiter took the plate back to the kitchen. As a chocoholic with a huge sweet tooth, I never wanted to leave a single morsel behind… But that meant I often walked out with the waistband of my jeans feeling a little too tight! 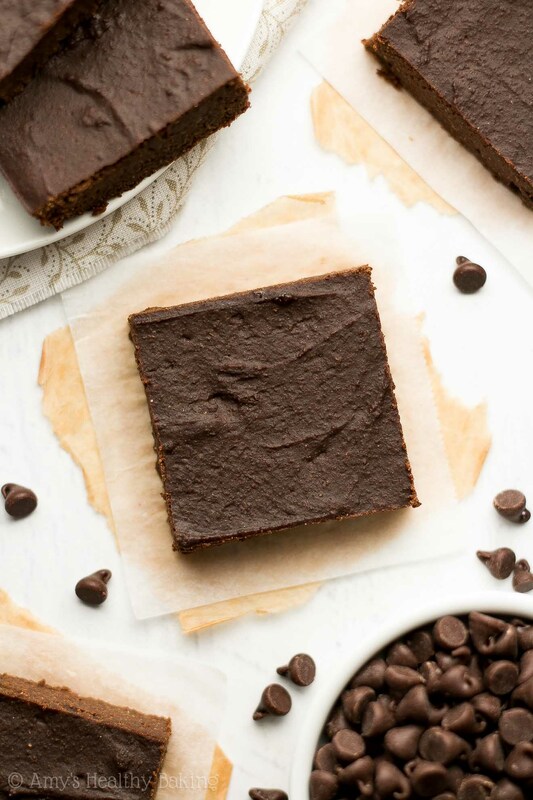 Which is why I ♡ this recipe for Healthy Small Batch Fudgy Dark Chocolate Brownies! With so few servings, it’s nearly impossible to over-indulge, even for a brownie-obsessed girl like me. Plus they contain no butter, refined flour or sugar and only 67 calories! Even better? If you devoured the entire pan in one sitting, and topped it with ice cream and caramel and chocolate sauce… You’d still eat fewer calories than if you had one of those Brownie Obsessions from the restaurant! ?? To make this easy recipe, you’ll start with white whole wheat flour (like this!) 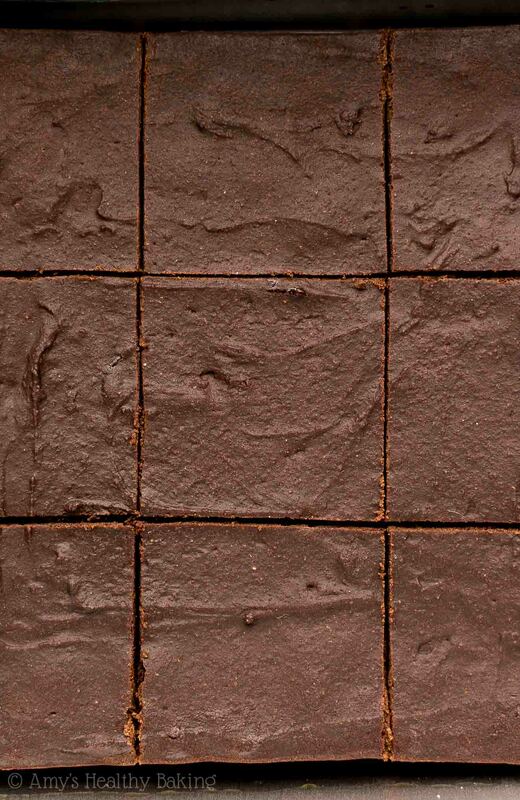 and cocoa powder (like this!). Yes, white whole wheat flour actually exists! It’s made by finely grinding a special type of soft white wheat, which has the same health benefits as regular wheat but a lighter taste and texture. 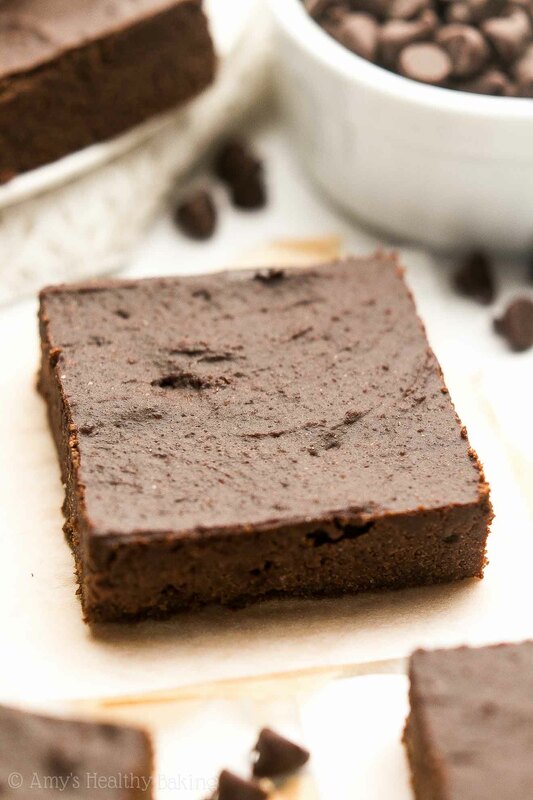 That makes it perfect for these fudgy brownies! It’s extremely important to measure the flour and cocoa powder correctly, using this method or a kitchen scale. Too much of either will dry out the batter and make your brownies cakey, and too much cocoa powder will make them taste bitter, rather than perfectly rich and decadent. This is the kitchen scale I own, and I highly recommend it! I use it to make every recipe I share with you because it ensures my treats turn out with the perfect taste and texture every time. 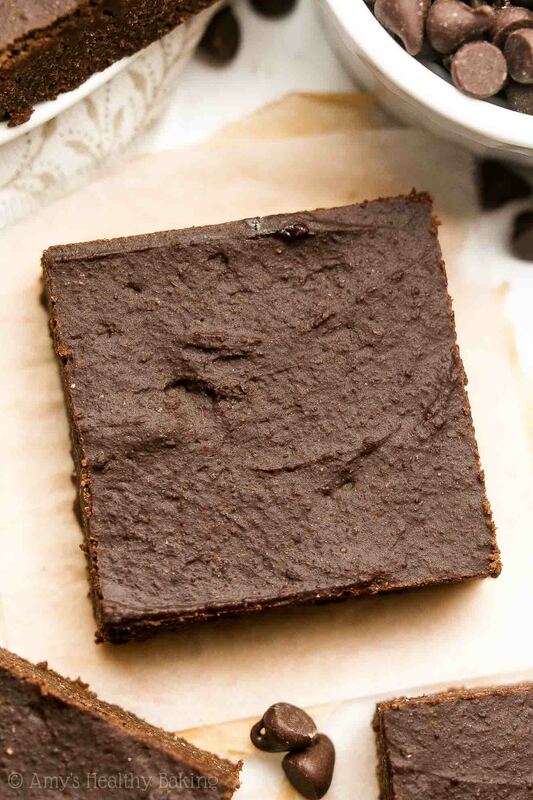 Instead of refined sugar, you’ll sweeten these brownies with pure maple syrup, like this! Make sure you buy the real kind! Skip the pancake syrup and sugar-free syrup because those contain corn syrup or artificial ingredients, which we’re avoiding in this healthy recipe. The only ingredient on the label should be “maple syrup,” and it generally comes in thin glass bottles or squat plastic jugs. 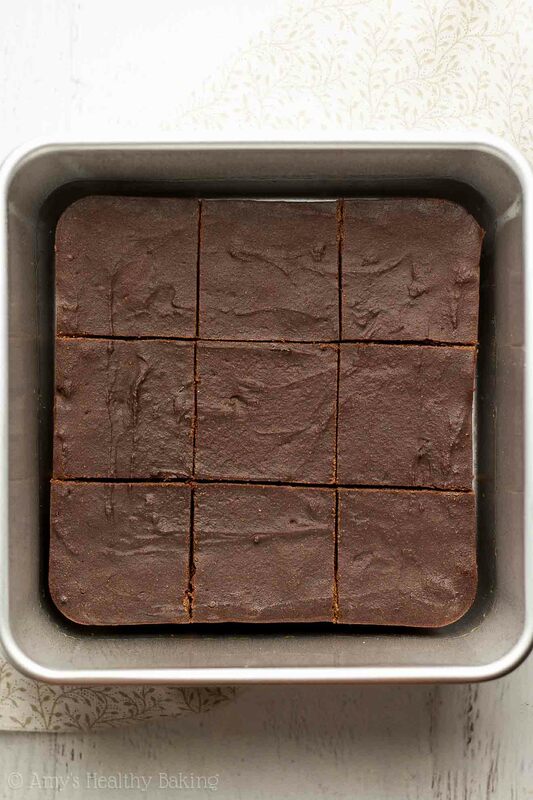 Because you’re making so little batter, you’ll need a small 6”-square pan to bake it in. I found these at Walmart on the wedding aisle, and they last for ages and work perfectly! Isn’t that size adorable?? In a pinch, you can use a 8×4” loaf pan or two mini loaf pans. So, my fellow brownie lover, how perfect does that look?? ? And when you make your own, remember to snap a picture and share it on Instagram using #amyshealthybaking and tagging @amyshealthybaking IN the photo itself! (That guarantees I’ll see your picture! ?) I’d love to see your brownies and feature them in my Sunday Spotlight series! 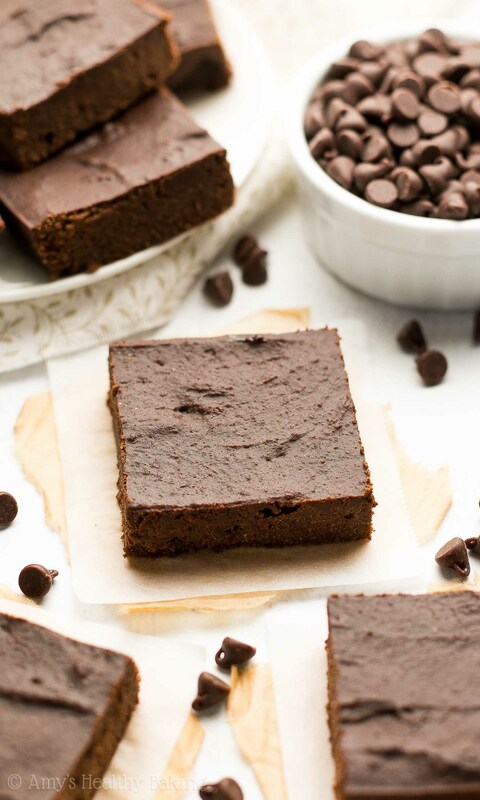 These fudgy brownies are perfect for any chocoholic! They taste very rich, similar to 72% dark chocolate. Leftovers will keep for at least 5 days if stored in an airtight container in the refrigerator. Preheat the oven to 300°F, and lightly coat a 6”-square baking pan with nonstick cooking spray. 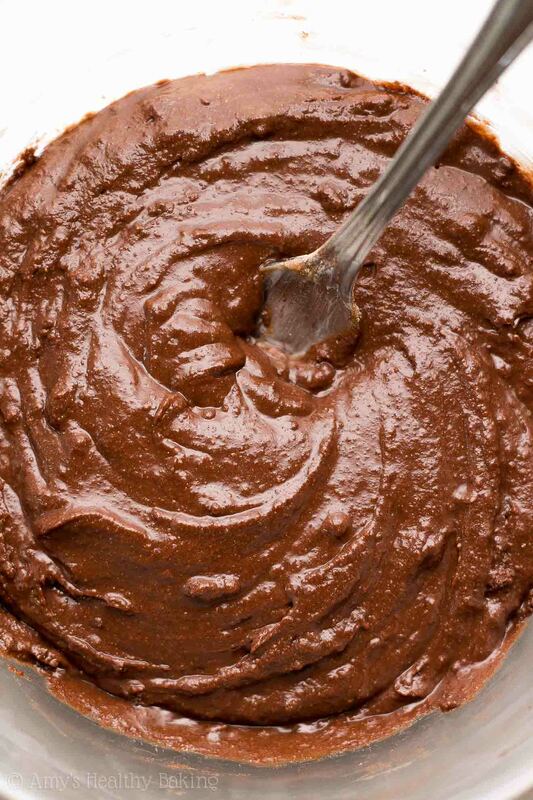 In a medium bowl, whisk together the flour, cocoa powder, baking powder, and salt. In a separate bowl, whisk together the butter, egg, and vanilla. Stir in the Greek yogurt, mixing until no large lumps remain. Stir in the maple syrup. Mix in the flour mixture, stirring just until incorporated. Spread the batter into the prepared pan. Bake at 300°F for 10-14 minutes (10 minutes yields the fudgiest brownies; 14 minutes yields slightly firmer brownies). Cool completely to room temperature in the pan, and let the brownies sit for at least 8 hours at room temperature for the fudgiest texture before serving. 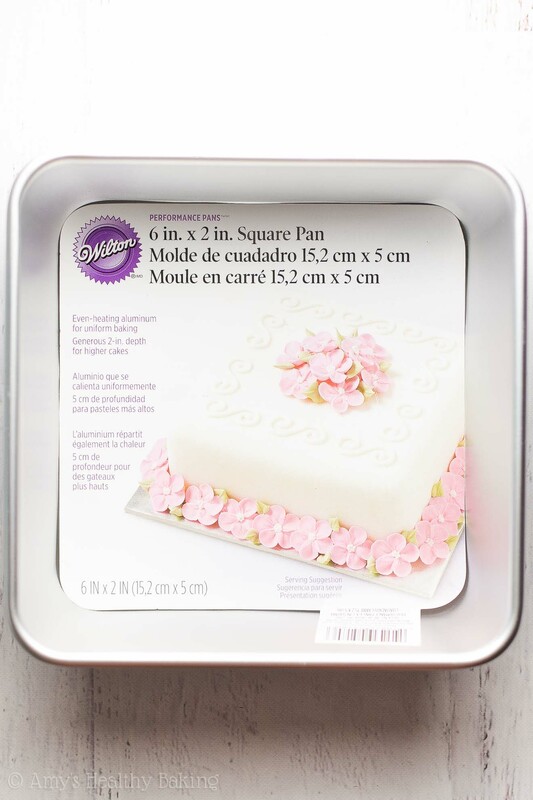 Notes: This is the 6”-square baking pan that I use. I found mine at Walmart on their wedding aisle! If you can’t find one (and they’re really handy to have! ), then substitute an 8x4” loaf pan –OR– divide the batter between two mini loaf pans (they should be 5¾x3” in size). For the gluten-free flour, use as follows: ¼ cup (30g) millet flour, 1 tablespoon (7g) brown rice flour, 1 tablespoon (8g) tapioca flour, and ¼ teaspoon xanthan gum. Most store-bought gluten-free flour blends will work as well, if measured like this. I don’t recommend using Dutched or special dark cocoa powder. The brownies already taste very rich and dark chocolaty without it! Be very careful when measuring the cocoa powder, using this method or a kitchen scale. (That's the one I own and love!) Too much cocoa powder will make your brownies dry and taste bitter. Want to make a regular-sized pan of brownies instead? Then follow this recipe of mine! If I wanted to replace the maple syrup with a 1/4 cup granulated coconut sugar or cane sugar, how would I adjust for the liquids? Would I add 1/4 milk for example to compensate? I really appreciate your interest in my recipe, Claudia! To substitute coconut sugar for the maple syrup, use ¼ cup of coconut sugar + 2 tablespoons of milk. 🙂 I can’t wait to hear what you think of these brownies! They turned out great! So fudgy and delicious, thank you so much! ? It’s my pleasure, Claudia! I’m so glad you loved these brownies! 🙂 Thank YOU for taking the time to let me know! HI Amy – we made this small batch last night and the brownies tasted delicious. I want to know if they are meant to be eaten with a fork as they would not hold up on their own. I followed the ingredient measurements precisely, but used a parchment-lined 8X4 Pyrex loaf pan. Baked at 300 for 12 min and consumed a little over 7 hours later. Again loved the taste, but would prefer the hand-held version. Thank you! 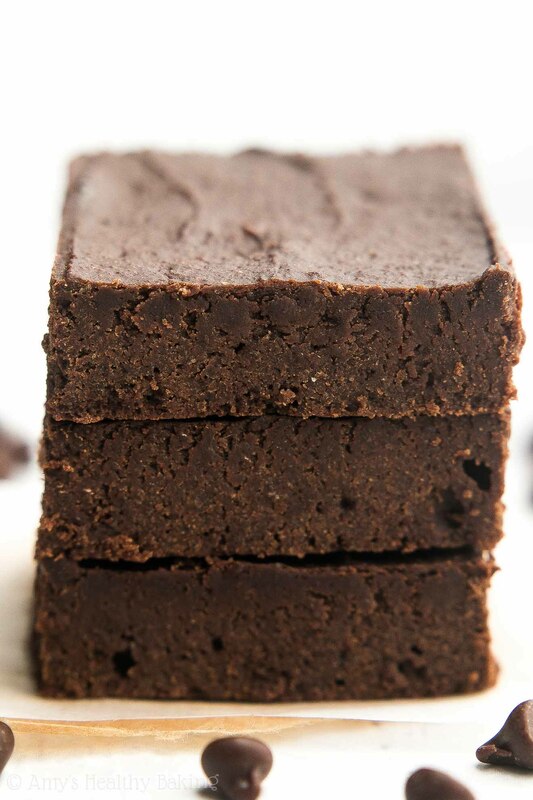 Hi Amy – loved the taste and super-fudginess of these brownies. Just one thing: my brownies had a very gooey texture and did not hold up easily and so we needed to eat with a fork. I followed the preparation precisely, but used an 8×4 loaf pan. Should I have increased the temperature or baking time? Thank you! I’ve made these brownies thus far and they taste great! One problem, though: in both cases, they did not look like your brownies at all. Rather, they were too fudgey and gooey. The first time, I used a 9 x 9 pan because it was all I had. The second time, I used a 7 x 7 and baked it two minutes longer. What am I doing wrong? It can’t just be the pan size, right? Thanks! Wow, thanks for such a prompt response! In both cases, I did not modify the recipe, so I understand why the outcome would be slightly off, relying on differently-sized pans. By gooey and fudgey, yes, I guess I mean underdone. I know the recipe is meant to be fudgey, but my product looks nothing like your photos. It looks more like the batter, except a little harder and darker. Do you use a mixer, by any chance, or do you do all the whisking and mixing manually? I’ve been doing so manually, and wonder how different the final product would being done with a mixer. – I just noticed the many typos in my comments – sorry about that! I blame autocorrect! – Yes, the final product was rather thin compared to your brownies. It still tasted great! I’m just concerned about the texture. Is there anything I can do to improve the final product while still using the 7 x 7 pan? I can’t find a 6 x 6 one. – I went with the instructions and did everything by hand. A thought just occurred to me about the mixer, hence my question. I had wondered whether it would fix the texture in my case, but maybe not. Hi Amy – Do you have any suggestions on how to make this sugar free? Thank you! I have sweet leaf vanilla creme drops, and I also have swerve. I wasn’t sure if you left out the option for sugar-free due to the chemical requirement that sugar would bring to the baking. Thanks again. It’s my pleasure Ila! I’ve made a non-small batch sugar-free version here with the liquid vanilla stevia. However, I’ve found that cocoa powder mutes the stevia’s sweetness, so those brownies, even though they should taste just as sweet based on the amount of stevia used, still taste much darker than the original maple syrup version. Hi Amy! Can I use a flaxseed egg instead of a normal egg for this recipe? Can I directly substitute it or do I have to make any other adjustments?